THANK YOU! 감사합니다! ありがとう! Merci! ขอขอบคุณคุณ! شكرا! Danke! 謝謝! 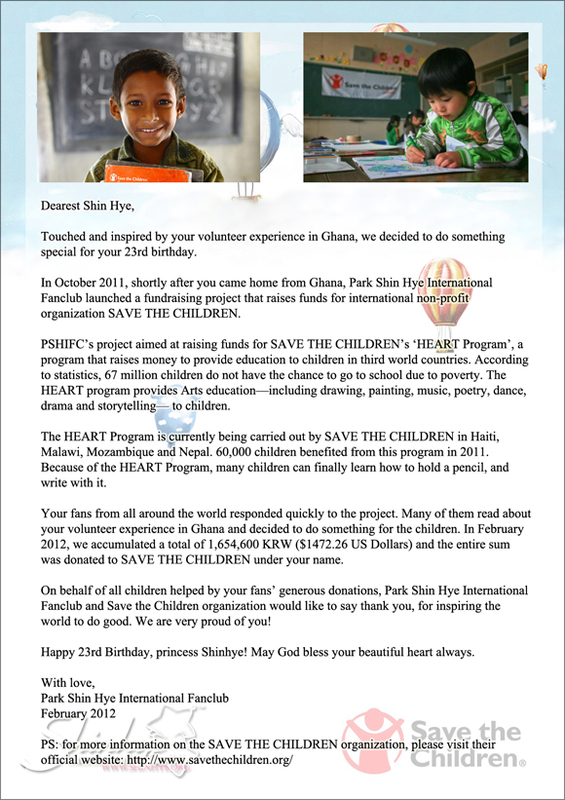 We have donated the money raised to the Save the Children Foundation (세이브더칠드런). 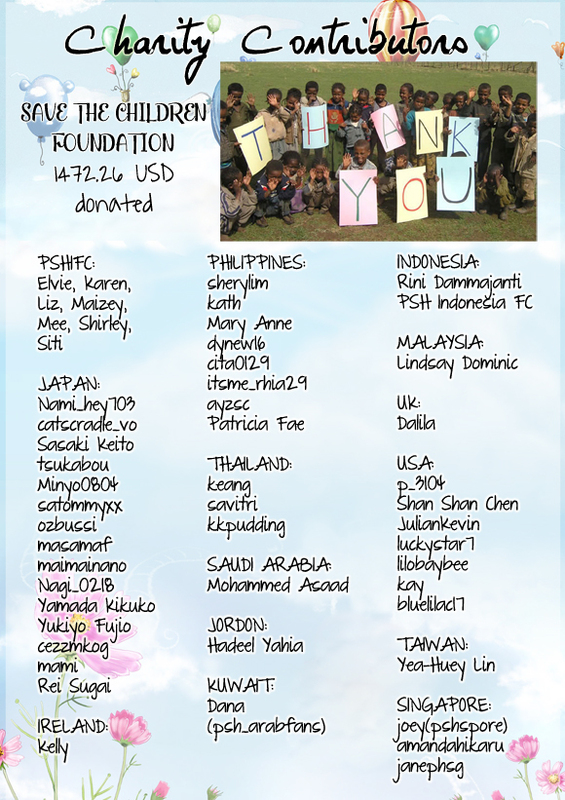 and with that we would like to take this time to thank everyone who had participated and gave selflessly to the cause. Thank you so much! We couldn't have done this without your tremendous generosity. Your kindness knows no bounds. We are so proud to have such fantastic members. We have seen Shin Hye demonstrate time and again her kind heart and her humble character through her acts of charity. Every year on her birthday, Shin Hye would spend the day at a shelter helping those in need. This year was no different. Even though she didn't spend it at the shelter, what she did was just as inspiring because the ticket sales from her birthday fan meeting went to Korean Food for the Hungry International-particularly to help Ghana. Shin Hye's kindness and selflessness touched and inspired all of us. Since the creation of this site, it has been our tradition to donate to charity every year under Shin Hye's name, honoring her for the very special person she is. Because of your donation, we were able to keep up this tradition. Since hearing that she went to Ghana and seeing what she did there, we launched our charity fundraiser. Throughout the months, you gave selflessly just like Shin Hye. When everything was totaled and collected, we were able to raise $1472.26USD (= 1,654,650₩ Korean Won) for Save the Children. Great work, everyone! We're so proud. 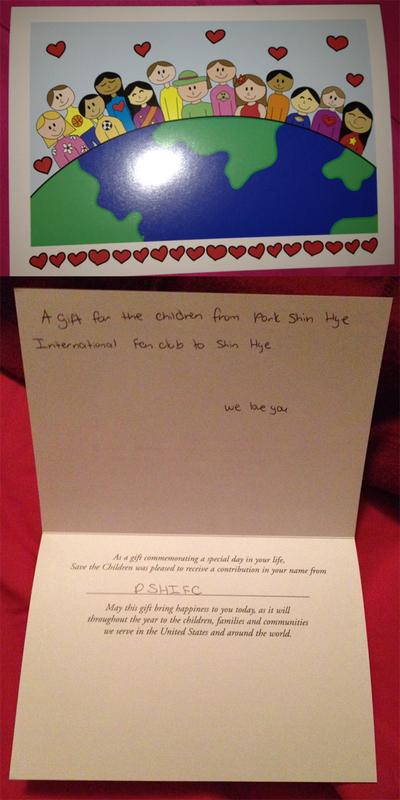 The money donated went specifically to Save the Children's HEART program. The HEART program is a program that raises money to provide education to children in third world countries. According to statistics, 67 million children do not have the chance to go to school due to poverty. This program provides Arts education-including drawing, painting, music, poetry, dance, drama, and storytelling-to children. The HEART program is currently being carried out by Save the Children in Haiti, Malawi, Mozambique, and Nepal. 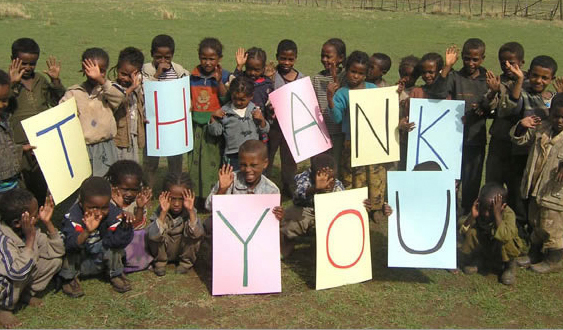 60,000 children benefited from this program in 2011. Park Shin Hye is truly inspirational. And for that we are so proud to be called her fans. By coming together and helping each other, we can make a difference in the world, one step at a time. If we've missed anyone, please let us know as soon as possible. Email us at shinhyeorg@gmail.com.